Earn up to 22,360 reward points. Packed with innovations that improve playability, expand versatility and make it the bass to beat. Meticulously crafted in the Czech Republic, the CR5 RADIUS Bass Guitar embodies a breadth of experience, insight, and design brilliance that only Ned Steinberger can bring to the creation of a new classic. His approach to the RADIUS, as with every new instrument, was to re-explore each facet of a bass guitar, leading to innovations such as the Fusion neck, the Diradial body design, the NS tuning system, and the NS/EMG pickup system. However, what makes this instrument most remarkable is its seamless integration of feature, form and function. The sensuous lines of the RADIUS are balanced and refreshing, which is exactly how it feels to hold and to play it. 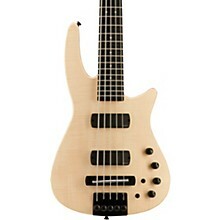 Most of all, the RADIUS is, by design, the most sonically dynamic, versatile and exciting bass available today. The RADIUS' maple body, with flamed maple top, has a convex back radius, which provides enhanced contact and stability against the torso. The front of the instrument is more tightly radiused, which, in combination with the general wedge shape of the body, shifts it into more comfortable orientation with the right hand. The distinctive horn provides a natural grip, and the configuration of the body cutaway provides easy access to the highest frets. The instrument as a whole is perfectly balanced, no downward dip of the neck, giving the left hand unprecedented freedom. Combined, the shape, balance and light weight of the RADIUS, just 8.3lb., make this instrument exceptionally comfortable to play. NS Patented Tuning System (US Patent 6,528,710): Based on a design originally created for the NS violin, the RADIUS has a self-clamping, precision tuning machine, built into the body. 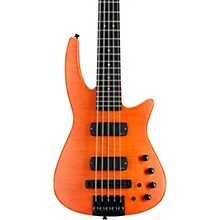 This fast, simple system accepts any standard single-ball end, full-scale bass guitar string. No tools are needed: simply rotate the knurled knob to change a string or tune the instrument. NS Design and EMG have collaborated to create this integrated piezo and magnetic pickup system. It features an 18V onboard preamp, which provides extraordinary dynamic headroom. The active electronics are combined with the NS bridge-mounted Polar pickup system, the marriage of which puts an exceptionally broad, musically rich spectrum of tone at the player's fingertips. Custom crafted for NS Design by Hipshot, the aluminum one-piece bridge and saddle assembly provide full height and angle adjustment, allowing the player to precisely tailor the action and tweak the intonation. 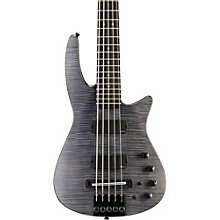 What more could you want in a bass? Order today. 12th Fret Width - 2.54"